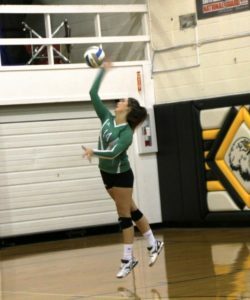 Colome volleyball team played Ainsworth, Neb. and Stuart, Neb., in a quadrangular on Oct. 2. The Cowgirls were defeated by Ainsworth 3-2. Colome took the first set 25-20 and the fourth set 25-15. Ainsworth won the other three sets. Baylie Hoffine scored 9 points, Haley Krumpus and Makayla Shippy had 8 points each. Kaydee Heath had 16 kills. Shippy had 30 set assists. Kaydee Heath had 20 digs and Shippy 13. Stuart defeated Colome 3-0, 12-25, 25-27 and 23-25. Shippy had 15 points and one ace. Kaydee Heath had 7 kills. Shippy had 16 assists. Shippy and Hoffine each had 8 digs. Colome will host White River on Oct 11 and play in the Andes Tournament on Oct. 13.